" Ahm tells us of the Great Nothingness before She and the Stillness seperated; and She brought into being space and the Realm." "A true and loving Parent has no wish for their child to Worship them for the gift of Life. They wish only for the well being of their child and hope for Love." I am the Lady Shiryan, High Priestess of the Temple of Vathnia. My Vathnian mother was Mary, I was raised by a wonderful step-father named Joseph. I was due in Dec., but being a female, I was fashionably late and arrived in Jan. LOL My Father has a wicked sense of humour. As you may have guessed, my Father is the Archangel Lucifer. Bond mate to the Goddess Athanasia, who is My true Mother. I have become close to both of them over the last couple of years. It has been an amazing experience. One I never imagined I would ever have, but one I wouldn't give up for anything. The Goddess is kind and loving. She is caring and concerned for us. She is what a true creator is and what we've always needed. She is the epitome of a good and loving parent. My Father? He is loving and kind. He is honorable and caring. He is everything that we have always found noble in the male. Everything that our males are being stripped of. He is truely the Light that He has always been proclaimed. That Light that will soon return . To save you from the horror that has become your life here. ​I and some of My Knights are currently looking for the eighth (8th) and probably final location. Only members that are involved and regularly contributing (tithing) to the Temple will be giving the location and allowed to join us. ​​If there are any others who would like to talk about forming another group/retreat, please email Me personally here and we can discuss it. Any that wish to join My personal retreat will need to get in touch soon. ​The Knights are greatly concerned for safety and wish to establish this retreat quickly. There have been too many delays already. We live not in a Universe, but in a Realm or bubble. One of many, many billions of Realms. The original Realm was created by the Goddess Ahm. Imagine one immense globe or bubble, surrounded by billions upon billions of smaller bubbles. A huge soap bubble with smaller ones clinging to it. The Goddess Ahm created these by forming extremely massive black holes within the original realm. These form wormholes or singularities, that reach out into null space and form a time space bubble around a white hole. This causes an almost instantanious expansion of the bubble......AKA "The Big Bang"
The Goddess that rules our realm is the Goddess Nyx. She rules here with Her Daughters. One of Her Daughters, the Goddess Athanasia is our Creator. All of the Goddess' have a bond mate. An Archangel created just for them by the Goddess Nyx. Athanasias' bond mate is the Archangel Lucifer. They are My true parents. 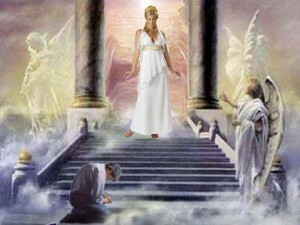 Now for the interesting part....*grin* Athanasia created all sentient life in this realm.....Immortal. None of Her children were ever meant to die. She meant for them to grow and learn and expand throughout the Realm. On this world, Vathnia, there was a battle among the Archangels. 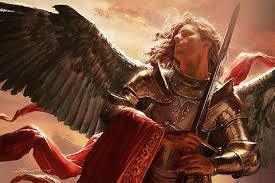 The Archangel Adion and some of his soldiers discovered that consuming soul energy from recently killed bodies, gave them a tremendous increase in power.As soon as his treachery was discovered, Athanasia sent Lucifer and his Legions to do battle. You know of this from the story of the great battle in heaven told in the Christian Bible. Though Adion did give his personal spin to the story. There are also tales of the battles told by other ancient peoples and religions. Lucifer was forced to pull back when the loss of human life became unbearable. After that, Adion had the DNA altered to make the species mortal. The lifespan was made extremely short, fertility was high. He needed a fast turnover. Many, many souls to feed him and his soldiers. This is where we are now. He has played at being god(s). He keeps us breeding , keeps us fighting and keeps us dying. But now he has his sights on targets beyond Vathnia. He wants more power. Lucifer has been ordered to defeat him. At All Costs!! My Father and his Legions will not retreat this time. They will be Victorious!! Our only chance is to find a safe place and survive the coming war. The plan is to keep as many souls from him as possible. When will the Battle Begin? ​I have learned, while talking with My Parents, that the mortal fixation with time is not theirs. My attempst to pin down My parents on a time table for past and future events, have proven fruitless. They just don't view time the same way we do. It's not important to them. That said; I believe we have less than 20 yrs until the beginning of the final battle. Adion and his forces are slowly ramping things up. Stirring the pot, so to speak. Even he doesn't know when Lucifer and His Legions will arrive, so he is building his power and preparing. I feel no overpowering desparation,yet. Though I have felt subtle attacks from him. Nothing of any force, so far. We will all be feeling his anger and desperation as time grows shorter. In some ways 20 yrs seems like a long time, but consider. I said we have less than that. It's probably closer to 15 and could be as little as 10. There really is little way of knowing until it gets closer to the actual battle. As the Legions approach, I will know. And there is so much to accomplish in whatever time we have. To warn and educate as many people as possible. To teach as many as possible to protect themselves. To keep every soul we can from Adion. To deny him that power is to aid the Goddess and Lucifer in his defeat.